A systematized workflow is the greatest defense against employee distraction. All of us get distracted throughout the day, which means that daily tasks are sometimes pushed aside. We end up in a reactive mode all day. If it happens to us, why wouldn’t it also happen to our employees? So how do we safeguard against this? By implementing a systematized workflow. Every employee I have hired has been a mobile employee. They generally work from home. Some are full time, some part time and some just project based or freelance. The only way to keep them all on the same page and productive, is to have a well defined work flow for them. For project based or freelance, you may not need something like this but there are still some takeaways you can use. To handle my task management, I use TeamworkPM (affiliate link). It’s my personal choice, but any project management program that you prefer will do just fine. I have recurring tasks set up for each employee. So I can easily set up daily, weekly and monthly tasks. Each day they log in and can see what tasks are scheduled for the day. I can add in additional tasks when necessary. There are a lot more uses for TeamworkPM but for this post we will stick with task management. So step 1 in your systematized workflow is to get a task management system in place. Do not leave these tasks to chance. Distractions can and will happen every day and this is where tasks start to slip. By having each task planned out and on autopilot, you can be sure that your employees will have something keeping them on track. Once we have our task management or project management in place, we need to set up a workflow. This is a process for how their work day should go. Chances are, there will be more than one place to get tasks from. Like for instance, at times I will simply email a task. Or another team member may need to email a task. These are tasks that don’t necessarily need to be entered into TeamworkPM. So their needs to be a flow to how those tasks are handled. 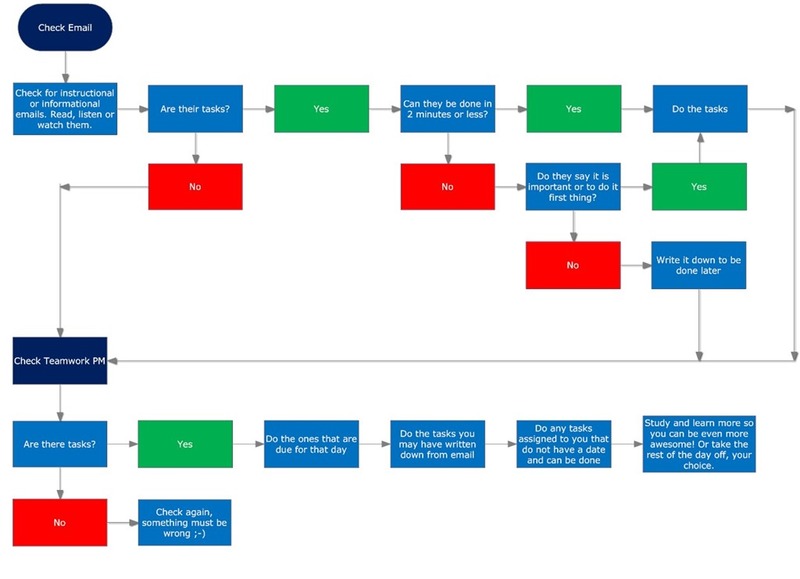 For that, I have created a chart that each employee gets. This chart shows how they are to go about their day and get to the tasks that are scheduled. You can see that not all tasks have a due date or need to be done that day. So they can choose which ones they can do that day. You’ll also notice that I allow my team to take the rest of the day off if there aren’t any other tasks for them to do. Being that it is a mobile team, I don’t care about how many hours they work, I care that the work gets done. This structure has worked well for me and I will often see tasks being done on weekends or at night. They may have a light week and decide to put in some time on the weekend. Or get a head start on the week. I am perfectly fine with this and it gives my team a little freedom to work at their own pace. Again, what matters most to me is that the work gets done and is done right. Do you have a workflow for yourself or your employees? Feel free to share it in the comments. 1. Get a task management system to manage the tasks for your team. 2. Create a workflow for them to follow and be sure they stick with it.